Bramer Sod Farms, Inc. is a family owned and operated turf business with over 40 years of experience. Over 300 acres of Fescue and Kentucky Bluegrass turf are in production at this time. Customer satisfaction through quality turf and superior service is our goal. Bramer Sod Farms has been honored with the Blue Ribbon for Bluegrass Turf at the Kentucky State Fair 7 times. This impressive fact only confirms our commitment to quality turf and our consistency in producing a top product. From Rough Grade to Finished Lawn, Bramer Sod Farms, Inc. can provide for your needs. Look through our web site and see what we can do for you! If you have any questions or requests, fill out our form for sod and turf product requests or call us at (502) 499-6711 and we'll get back to you! 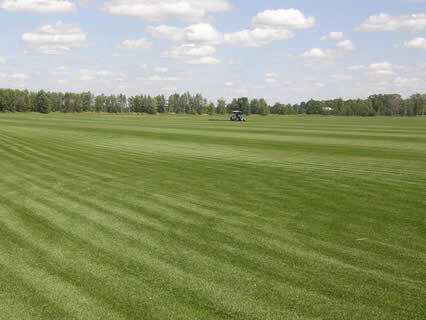 Bramer Sod Farms, Inc. is a family owned and operated turf business with over 40 years of experience.